36100 Five Mile Rd. (E. Levan) Livonia. Mariam Ellen Perria Mackinder was born in Clawson, Michigan on February 16, 1919 to her parents Alex and Hazel Perria. She had an older sister, Doris and a younger brother, Richard. When Mariam was about 7, her father left his family, which caused her mother, Hazel, to ultimately put her 3 children in Children's Homes or Orphanages. When Mariam was about 13, she left the last place she was at - St. Agnes Home for Girls in Romeo, Michigan - and went to live with family friends. The following year, Mariam lived with her mother and brother in Highland Park. When Mariam was about 16, she was urged by her mother to leave high school so she could help her older sister Doris, who was married, with her 3 small children. Mariam was hoping to be the first person in her family to graduate from high school, but this was not to be. She moved back with her mother a few years later, enrolled in a business school in downtown Detroit, and worked at Sanders on Woodward Ave and West Grand Boulevard in the evening. It was here that Mariam met her future husband, Hollis Mackinder, who would come into Sanders to eat before he went to his job at Western Union in the nearby General Motors Building. Mariam and Hollis married on November 11, 1940 and lived in Detroit. They had 3 children: Judy, Frederick and Peggy. When her youngest daughter, Peggy was in Kindergarten, Mariam went to work part-time, at first, then full-time for the JL Hudson Company - first at Northland Center and then 12-Oaks Mall, after she and Hollis moved to Novi in 1977. Mariam continued working at Hudson’s (Macy’s), in the jewelry department, until she retired in 1984. After her husband, Hollis passed away in 1987, Mariam continued living in their 4 bedroom home - taking care of it and even mowing the lawn when she was in her mid-80's. Mariam enjoyed bowling and bowled for many years on 2 leagues, but most of all she loved her family. When it appeared to her family, that her house was becoming too much for her to handle, Mariam moved to Oakmont Retirement Community on 7 Mile Rd. in Northville in 2012. She enjoyed the activites that this place provided and being with people. She also enjoyed visits from her family. In the fall of 2015, it became evident that Mariam was having some memory issues. Since staying at Oakmont was not the best place for her now, it was agreed that she move into Fred and his wife, Kristina’s, home in Canton. They rearranged their living quarters, so that Mariam had her own space. She was lovingly cared for there and enjoyed watching old musicals on TV. Mariam always looked forward to weekly visits with her children and sometimes her grandchildren and great-grandchildren. On February 16, 2019, Mariam enjoyed an Open House celebrating her 100th Birthday with family and close friends. Mariam has been a life-long Christian Scientist. Her strong faith has contributed to her living with a positive attitude. Her family was extremely important to her and she would go out of her way to do anything for them. Mariam and her ever-present smile will be greatly missed by her 3 children: Judy (the late Russell) Sarns, Frederick (Kristina) Mackinder and Peggy (Tom) Westman; 7 grandchildren: David (Bianca) Sarns, Christopher (Nicole) Mackinder, Nicholas Mackinder, Mackenzie Mackinder, Jeffrey (Lauren) Jenkins, Gregory (Zabeth) Jenkins and Steven Jenkins and 5 great-grandchildren: Colin and Emma Sarns, Liam and Noelle Mackinder and Aria Mackinder. 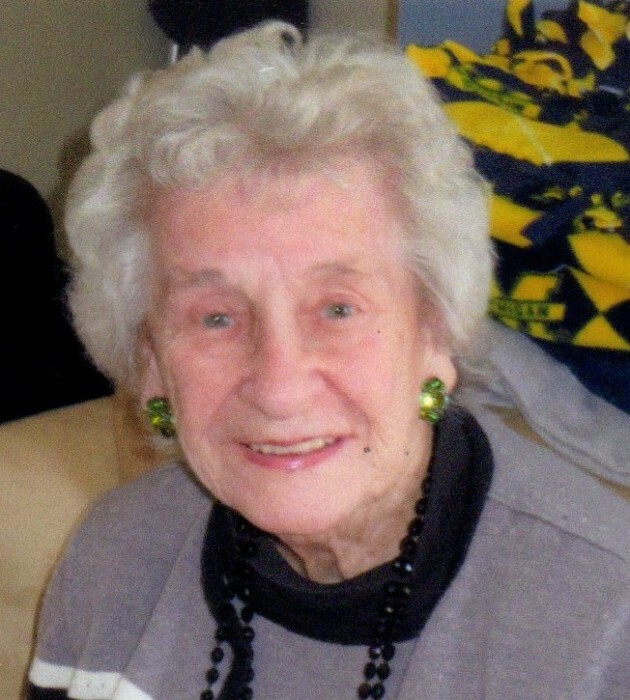 Mariam gently passed away on Wednesday, March 27, 2019, surrounded by loving family and in her familiar surroundings in Canton. She also is survived by many nieces and nephews.